For Grace Brothers’ Brewery, 1905 was a miserable year. Just days into January, the Santa Rosa beer makers were smack in the middle of “The Battle of Sebastopol Avenue,” with some angry locals demanding the city tear up their railway spur, apparently believing the brewers were in cahoots with the steam railroad. Then in late December, it was reported in the San Francisco Chronicle that an analysis found samples of their beer were adulterated. The brewery made no comment at the time; the substance found was a harmless preservative that had been added to beer for decades. And why should they draw attention to the report? Neither of the Santa Rosa papers mentioned it, after all. All of that changed a couple of weeks later, when the Santa Rosa Republican printed the worst story imaginable. 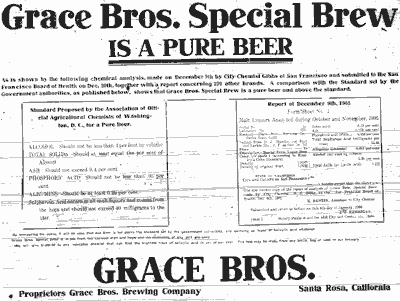 Grace Brothers beer was adulterated with a substance that was “poisonous” (poison was mentioned three times, acid seven times, in the short article), “like formaldehyde,” and “prohibited by the Health Board of San Francisco.” Holy Ned! Demand that the sheriff arrest those varmits! Oh, wait — that would be Sheriff Frank Grace, one of those aforementioned brothers. The brewery hit back hard with a half-page ad — significantly, in the Press Democrat only — defending the purity of their suds: “Grace Bros. Special Brew IS A PURE BEER.” They also ran a front page notice, offering a $1,000 reward to “any reputable chemist” who found adulterants in any of their products. Although the Santa Rosa Republican story was sensationalized, irresponsible, and factually wrong, the newspaper still gets an “E for effort” for mentioning anything about a local public health issue, a topic normally taboo in the Santa Rosa papers. But contaminated, even deadly, food and drink was much in the national news in 1905; just a few days before the San Francisco report on adulterated beer came out, President Teddy Roosevelt said in his State of the Union message that any consumables “debased or adulterated so as to injure health or to deceive purchasers should be forbidden.” A few months afterward, in mid 1906, he made good on that promise and signed into law the nation’s pioneering Pure Food and Drug Act. The Republican’s article also mentioned adulterated milk, which may seem odd in an item about beer. But at that time, Americans were most likely to associate impure food or drink with milk. Bad milk was the example used frequently by reformers in speeches and magazine articles because contaminated milk was responsible 1 in 3 cases of infant mortality. But the problem with milk wasn’t added preservatives, as the Santa Rosa paper implies, but diseased cows, filth, and improper handling. City of San Francisco chemist Gibbs tested 275 samples of beer and malt liquors, finding 30 of them contained salicylic acid (he also found salicylic acid in 7 out of 120 white wines). A beer blogger found a 1906 New Hampshire report where 13 of 79 beers sold were preserved with salicylic acid. A natural plant hormone, salicylic acid is mainly found in nuts and fruits, with highest doses in spices and herbs. It has long been used as as a food preservative, and still is; according to the 2004 edition of the Bowes & Church nutritional guide, it can be found in some beers and other alcoholic drinks, tea bags, and soft drinks. Contrary to the Santa Rosa Republican article, a salicylic acid overdose in Grace Brothers beer would be impossible; a 150 lb. adult would have to drink 180 gallons at one sitting — about 10x his weight. Grace Brothers’ Brewing Company of this city, together with many other elsewhere, has come under the ban of a report made by City Chemist Gibbs of San Francisco on beers brewed in this State which contain adulterants, which report has been filed with the Health Board of that city. The report of Chemist Gibbs shows that beer made by the local brewery contains a quantity of salicylic acid, which is used as a preservative. This acid like formaldehyde and boracic acid, are poisonous in quantities if taken continuously the former being prohibited by the Health Board of San Francisco from being used as a preservative for milk. Milkmen of the metropolis are heavily fined when they are found to have used it. There is no great danger from salicylic acid unless it is used continuously or in quantities. To the continuous user of anything containing this acid, there is danger of being poisoned. The acid is not a food, and when taken into the system has to be worked off by the system. It is possibility of the the collection of a quantity of this acid in the system that causes danger to persons who are continually taking the poison into their systems. The report of City Chemist Gibbs covered an analysis of two hundred and seventy-five samples of beers and malt liquors, and of these fifteen firms were reported by Gibbs as containing the salicylic acid as a preservative. [“]The eighth report of City Chemist Gibbs file with the Health Officer yesterday contained the results of the analyses of 275 samples of malt liquors. [“]He comments upon the good effect of a notice sent out on July 20th warning liquor dealers that an inspection was being made. It was noticed that the larger dealers generally improved their product when they discovered that an investigation was in progress, while some of the smaller manufacturers continued to put out inferior or adulterated products regardless of their reputations. From a perusal of the above, it would appear that even if the charge were true, it would not be such a very serious matter, for most of the big breweries are included in the list. Th lists published by the other San Francisco papers contain many names in addition to those given in the Chronicle’s list. Grace Bros. however, deny the charge absolutely, so far as it affects them, and their offer would certainly appear to indicate that they know what they are talking about for there are no strings on it. They are of the opinion that their name was included in City Chemist Gibbs list through some clerical error. WRANGLING COWS ON COLLEGE AVE.